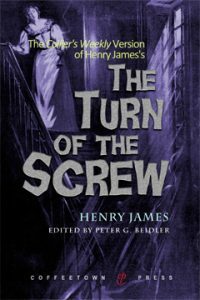 The Turn of the Screw is a classic chiller, written by Henry James in 1898. It is the story of a young woman who is employed by a wealthy military man to be governess to his niece and nephew. The children’s parents are dead and he is responsible for their welfare because he is their only living relative. The uncle lives in Harley Street, London; and although he wants to do his best for the children he has his own life to lead and, perhaps rather selfishly, does not want the responsibility of them. Believing that the countryside is probably the best environment for the children, he has installed them in his second home—the large country house of Bly. There are plenty of servants to take care of the children’s needs and the housekeeper, Mrs Grose, is in charge of all matters ‘below stairs’. It is the new governess though, who will head the household and all decisions to do with the children will be hers and hers alone, as will any problems. The uncle does not want to know. When she arrives at Bly the governess is impressed. All the windows are open the curtains are fresh curtains; and there is a nice lawn with bright flowers. It is not at all like the melancholy old building she had feared it to be. Mrs Grose is at the front door to meet the governess, offering her a polite curtsy and accompanied by Flora, the younger of the two children. Flora is the most beautiful little girl the governess has ever seen and she proves herself to be extremely well behaved and intelligent. She is a little angel. Mrs Grose informs the governess that she will have to wait until later in the week before meeting her other young charge. Miles is away at boarding school and will not return until Friday. Before Friday arrives though, bad news comes in the form of a letter. The letter is from Miles’ headmaster and it had originally been sent to the children’s Uncle who, on recognizing the writing, forwarded it to Bly, still unopened. The accompanying note reads, “This, I recognize is from the head-master and the head-master is an awful bore. Read him, please; deal with him; but mind you don’t report. Not a word. I’m off!” (Doesn’t he sound like a simply splendid chap?). The letter informs its reader that Miles has been expelled from school, and it further states that he is considered to be an “injury” to the other children. The Governess has already struck up a friendship with Mrs Grose, who is better acquainted with the children, and she seeks her opinion on the matter. Mrs Grose is shocked to tears by the head-masters statement. “See him, Miss, first. Then believe it!” The governess does just that and finds Miles, who is only ten-years-old, to be every bit as charming and lovable as his little sister Flora. Without even dignifying the head-master with a response to his letter and also without asking how Miles was supposed to be ‘an injury’ to anyone, she decides to school the young man herself, alongside his sister. Living in a lovely country house, with two darling little children to school and care for, the governess should have been quite content in her role, but dark forces are at work at Bly, and there is also the mystery of what happened to the children’s last governess, Miss Jessel. Although only young, Miss Jessel died rather suddenly, with the exact details of how and why she died seeming to be rather sketchy; worse still, for the governess is the fact that she keeps encountering her predecessor’s ghost. The governess might find Miss Jessel’s continued presence to be alarming, but her unhappy ghost is of little consequence in comparison to a strange and rather sinister looking man she has seen in and around the grounds of Bly. This man worries the governess a great deal and she again consults the ever friendly Mrs Grose, who listens to the description of the man and identifies him as being Peter Quint. Quint had at one time been valet to the master of Bly, but is now, and for all time, very much dead. The governess becomes convinced that the two ghosts have an interest in corrupting the children in some way. She even worries that they might have already succeeded in doing so to some extent. She also believes that Flora is aware of Miss Jessel’s presence and is only pretending to be ignorant of the ghost and that Miles and Peter Quint are meeting in secret. The governess sees it as her duty to protect the children from the influences of these two unsavoury entities at any cost. The problem is that, throughout the entire length of the book, the governess is the only person who actually sees the two ghosts. Or is, at any rate, the only person who will admit to seeing them. Because of this there are times when, as a reader, you are forced to wonder if you are reading a ghost story at all, or whether Quint and Jessel are merely the hallucinations of a sick mind. Personally, I kept coming back to the fact that the governess had described the ghosts in some detail to Mrs Grose and that Mrs Grose had so easily been able to put a name to the descriptions—people who the governess had never seen before. This makes me think that The Turn of the Screw is a ghost story and not just the tale of one woman’s downward spiral into dementia. Other readers might disagree and it is very much, I suppose, open to interpretation. At only 121 pages, The Turn of the Screw is not a long book, but it is a very clever story, and James manages to make the two children seem rather sinister at times, and even after finishing the book I am left wondering whether or not Miles and Flora were aware of the ghosts and if their angelic exterior perhaps didn’t hide a darker core. Again the answer is open to interpretation and each reader will have to decide for themselves. Were there ghosts at Bly, and were the children hiding a dark secret? Perhaps the answer to those questions isn’t important if it is a good story, well told. All told, I would have to say that The Turn of the Screw is a very good story, and it is one that tends to stay with the reader (this reader anyway) even after the final, shocking page has been turned.